Is time almost up for clockwatching lawyers? How might this impact your company, your costs, your opportunities? OF ALL the tedious tasks that lawyers have to do, time-recording is perhaps the most deadly. Private-practice lawyers account for their time in increments of 15 minutes, or even five or six minutes at some firms, and then send the bill to clients. This structure has been in place for decades. But cost-cutting has put a squeeze on companies’ legal budgets, and there is growing interest in doing away with the “billable hour” approach in favour of other pricing schemes. It is not hard to see why. 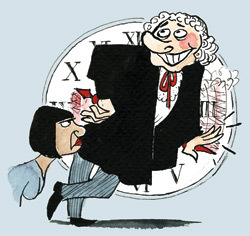 The hourly rate for a newly qualified lawyer at a big firm can reach £235 ($425). Most big British and American firms set targets for all their lawyers, from 1,300 billable hours a year to 1,800 hours and beyond. Lawyers who exceed their targets often get a bonus. But clients complain that this practice values the quantity of hours billed over quality and encourages padding. If the billable hour does perish, it will be at the hands of the clients, rather than the private-practice lawyers themselves. Some companies are starting to switch to fixed fees, with a performance bonus related to results. Tyco, an American conglomerate, took this approach with Eversheds, a British firm, in a deal signed earlier this year. The firm has taken on Tyco’s commercial legal work for a fixed fee, and will receive a bonus if it improves its client’s satisfaction by 35% and reduces litigation against Tyco by 15%. High-volume legal matters, which rely on precedents and templates, are the most obvious targets for fixed fees. Set prices can be put on anything from commercial contracts to trademark filing and personal-injury work. Litigation is less suited to fixed fees, however, because of its unpredictability. Some firms provide upfront estimates, whereas others charge a “blended fee” based on a combination of hours worked and a fixed fee. In America some companies take a share of the settlement. Wiley Rein & Fielding, a firm in Washington, DC, used this to great effect in March 2006 for NTP, a small firm which won $613m from Research In Motion, in a patent-infringement case over the BlackBerry e-mail device. The firm got $200m, which it shared among all its employees. Finding a new model to price legal services is no easy task. A lawyer’s skill, knowledge and experience are hard to quantify, as is the importance of a legal matter to a company. The fixed fee at least gives in-house lawyers certainty when budgeting and confidence when explaining that budget to the board. But the legal industry is not known for welcoming change. Whatever it turns out to be, the billable hour’s replacement must be easy to use—and must strike a compromise between clarity for the client and profits for the law firm.